Nearly 10 years after the Great Recession of 2007-09 that brought monetary and real disturbances across the world economy, researchers have stumbled upon a new and a rather ingenious business cycle fact that may aid in predicting upturns and downturns in an economy: the growth rate of conceptions as predictors of economic growth. While economists have uncovered such a relationship for the United States, a preliminary reading of Indian data also suggests similar patterns. Of course, a more in-depth and rigorous analysis is needed to unmask the trends. Such trends could be an aid in augmenting the much needed high-frequency indicators to aid policy making for the Indian economy. It is a well-known fact that modern developed economies, as documented by most recent studies, have tended to show a positive association between fertility rates and economic growth: procyclical fertility. Patrick Galloway in his 1988 study on pre-industrial Europe highlighted the sharp responsiveness of fertility rates to the price of food grains. A higher price of food grains meant lower economic well-being, in turn negatively influencing fertility rates. Moreover, the magnitude of positive association between fertility rates and economic growth was consistent across most of the pre-industrial European economies. While the fact remains that cross-country studies report a negative relationship between per-capita income and fertility levels, fertility rates indeed tend to be procyclical with economic movements. Indeed, statistics from the US’s National Center for Health Statistics show how the number of births began to decline in 2008 as the fallout of the Great Recession became prominent, falling by over 15% after hitting a 50-year high in 2007. In addition to these facts, economists have deciphered a new fact about the movement of fertility rates. According to a recently published working paper at the National Bureau of Economic Research (NBER) – a leading economic research organisation in the US – fertility data not only moves in tandem with economic cycles but can even help predict the onset of a recession or an upturn. Studying quarterly economic and demographic data for the last three decades (1988-2015) , researchers Kansey Buckles and Daniel Hungerman from University of Notre Dame, and Steven Lugauer from University of Kentucky find that the growth rate of conceptions falls sharply during a recession, and importantly, this fall actually begins a few quarters before the onset of a recession. In the jargon of macro-economics, the growth rate of conception is a leading indicator of business cycle, having predictive power in foretelling an impending downturn. Technically, conception is a measure based on births, therefore, it has a built-in nine month lag attached to it. This anticipatory nature of the growth rate of conceptions has been observed for all the major recessions in the last three decades, that of 1990, 2001, and 2008, and has been more pronounced in the recent recession. This high-frequency conception data allows authors to state a rather unconventional business cycle fact and we quote, “the growth rate of fertility declines prior to economic downturns and the decline occurs several quarters before recessions begin.” It is important to keep in mind that the fertility decline is solely driven by fall in conceptions for the US data rather than abortions or foetal deaths. 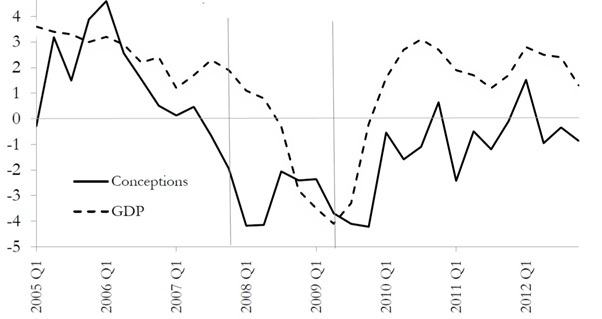 The extent of fall in conceptions is large, growth rate of conceptions fell nearly 5 percentage points at the onset of Great Recession of 2007-08. 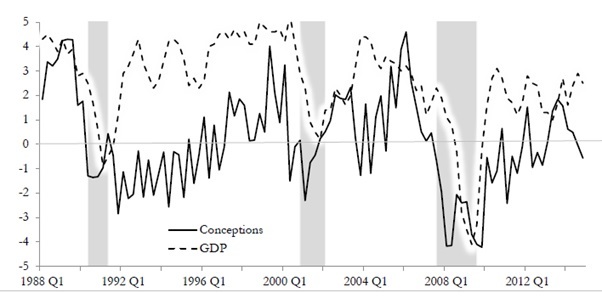 As mentioned above, the findings show that the growth rate of conceptions typically starts falling a few quarters before a recession, and since its is measure based on births, has an implicit 9 month lag built in to it. So what explains these possible associations? The hypothesis that researchers put forward is a straightforward one: Couples make forward looking decisions on having children based on economic outlook. If this hypothesis is true, then fertility behaviour in the US over the last three decades has been forward-looking and quick to respond to changes in the state of the economy. The explanation does depend on the assumption that almost all the conceptions are ‘planned’, i.e. couples are making conscious choices about bearing children, as opposed to unplanned, i.e. children born due to lack of contraception, out of wedlock, etc. With unplanned pregnancies being quite high in the US (estimates put it between 40-50% of all pregnancies), there is a legitimate question as to whether there are other factors in play which are causing this predictive relationship between growth rate of conceptions and economic growth. Nevertheless, if future economic conditions matter for current conception decisions, and if expectations are at least rational or future incorporating, movements in current conceptions may likely be harbingers of future conditions. That’s one part of the story. 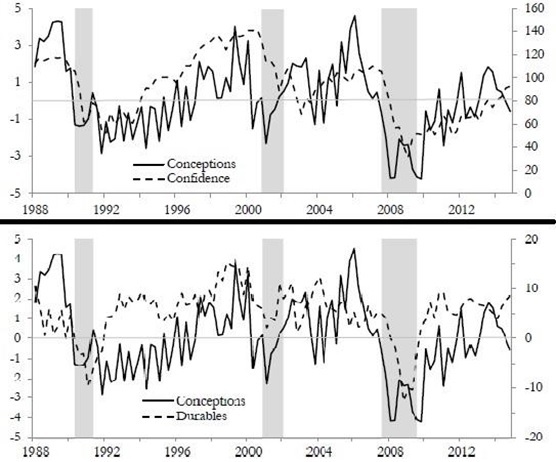 Interestingly, the researchers also find that the growth rate of conceptions tends to moves together with common economic indicators like consumer confidence and durables purchases, If you look at Figure 3, the fall in growth rate of conceptions coincides with or even precedes falls in consumer confidence and durable purchases. Consumer Confidence Index, Durable purchases are often looked upon as high frequency indicators that can foretell the prospects of the economy in the near term. In India, the Reserve Bank of India (RBI), Centre for Monitoring Indian Economy (CMIE) track independently consumer confidence which are useful aids in capturing expectations for the near term future of the economic situation. What does the trend seem like for India? We do a very preliminary exercise here and graph the growth of birth rate and GDP series for India. The graph points to some predictive behaviour but of course, this has to be subjected to more stringent and robust econometric evaluations. Also, we use birth rates, a measure different from conception rates that Buckles et.al have used. However, as a first pass, this must interest practitioners to look carefully between the associations. Although, we think that the hypothesis that Buckles et.al put forward may not hold tightly for India. With a low per capita income, a gloomy economic situation might step up conceptions as one needs more hands to feed. Again, all these are possible speculations and a careful analysis of the data will only uncover the mechanisms in place. While whether conception rates or birth rates should be the variable of interest can be discussed, a common challenge with using both these measures is that they are hard to measure in real time, even when compared to other measures like consumer purchases. However, with the coming of sophisticated data analytics and statistical techniques, it is quite possible to get predictions of these measures on a real time basis. One possible way to track conceptions is to use purchases of goods that are especially likely to be bought by those who are attempting to conceive or who are newly pregnant. This data is usually tracked real time by retail firms using scanner technology. In fact, this data is already being used by retail firms for targeted marketing and advertising. This New York Times piece in the year 2012 outlined how Target Corporation could observe, track and study consumer purchases and predict if a customer is pregnant. Most of the online portals place cookies on your devices to track your shopping habits. Therefore, there are tools that are available to harness real time data on conceptions. Of course, such tracking has to respect the contours of privacy since these are very private issues Buckles et. al explores few choices on tracking conceptions and interested readers are suggested to have a look at the appropriate sections. Yogi Berra (the legendary Yankees Baseball player), famous for his Yogi-isms, had once quipped, “It’s tough to make predictions, especially about the future.” It’s encouraging for policy practitioners to have such an evidence of conception rates as predictors of economic cycles. To our knowledge, this study is one of its kind and should make researchers across the globe investigate for such associations in their respective geographical spaces. Policy institutions in India often cite the lack of high frequency indicators that can be an aid in the policy formulation process. Buckles et.al should encourage them to hunt for innovative indicators and develop tools that can be usefully utilised. With so much jargon and tools being thrown around Big Data, it will be useful if researchers look at such meaningful constructs like Buckles et.al do.